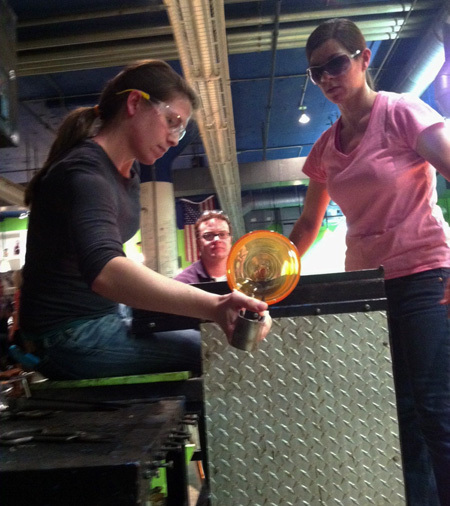 A few Fridays ago, I cashed in a sweet Groupon : a glass blowing party at J & C Glass Studio. I’ve been slowly working my way up in the world of hot glass. First, of course, are the fusing experiments I’ve been doing in my kiln, which usually don’t go above 1600°F. This allows for a “full fuse”, meaning the glass layers meld into each other until they appear as one flat piece of glass. Next came a class on lampworking glass beads with a torch (also a groupon! ): the torch can emit a flame of nearly 5000°F! But it is a small torch. But the glassblowing furnace? It holds a pool of molten glass at around 2000°F. Two thousand degrees! Held constant throughout the entire furnace! That’s a lot of energy. 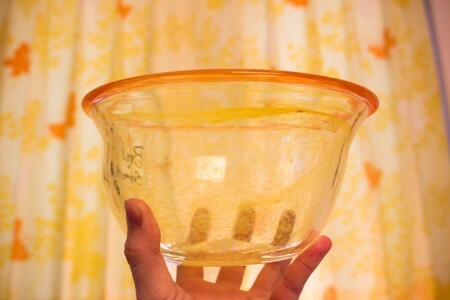 To make this bowl, we first dipped the end of the rod into the furnace of molten glass. All of the glass prepared for us in the furnace was clear glass – but in its molten state it was golden. After collecting this blob of molten glass on the end of the rod/tube, we dipped it in yellow frit. Frit is tiny pieces of glass, ground almost to a powder, all of a uniform color. It’s used to easily provide precise color in hot glass projects – but for us, it’s what gives this bowl its swirly, spotty coloring because each little fleck melts smoothly into the molten surface. Molten and fritted, it was time to blow the blob into a bulb. Blob to bulb to bowl! There’s a summary for you. These pictures are actually in the wrong order – sorry Brad, I wanted to be at the top of the post! 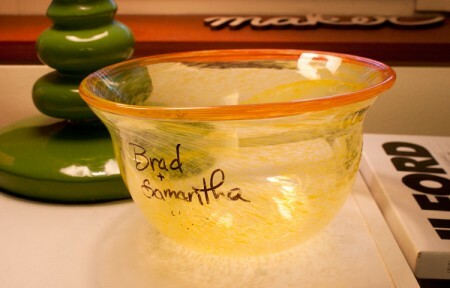 But the picture with Brad shows the bulb – it’s a blob of glass with a big air pocket inside. Once it’s big enough, the blowing part is done, and they actually stick it onto a second rod to start shaping the lip of the bowl. That’s what I did. When I started at the bench seat, I had a rod (Rod #2) with a bulb – and the bulb had a tiny hole on the end from where it had been removed from Rod #1. The instructor made sure the rod was kept spinning constantly while I pulled the lip down with those giant tongs. Somewhere in there we dipped the rim in orange frit so that the bowl would have an orange rim. What amazed me (and this shouldn’t have been a surprise, I know! ), was how hot the glass was. My arm was over the bowl as I used the tongs, and I thought I was being burned just from the heat emanating from the molten bowl. Brad felt the same way – he thought the hair on his arms was about to catch fire! When I got home, my arm was red and splotchy, like I had been sunburned. But it was fine by morning. I wasn’t worried, exactly, but it was a little bit painful! I gained a new respect for the artists who work at that studio every day. Once the bowl was appropriately sized and shaped, we removed it from the rod (accomplished using precise drips of water and a firm tap!) and it went into the kiln to be annealed – cooled slowly to prevent stress fracture. 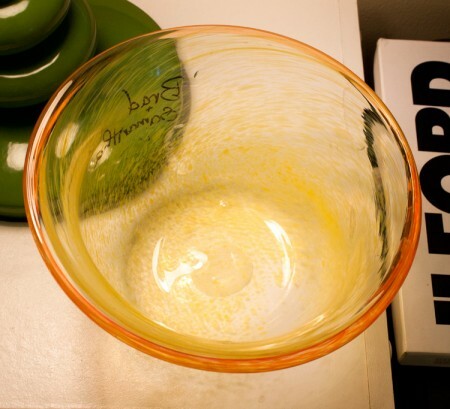 The whole process, from blob to bulb to bowl, took less than 15 minutes. With molten glass, you have to work fast! Last week, we got to go pick it up! 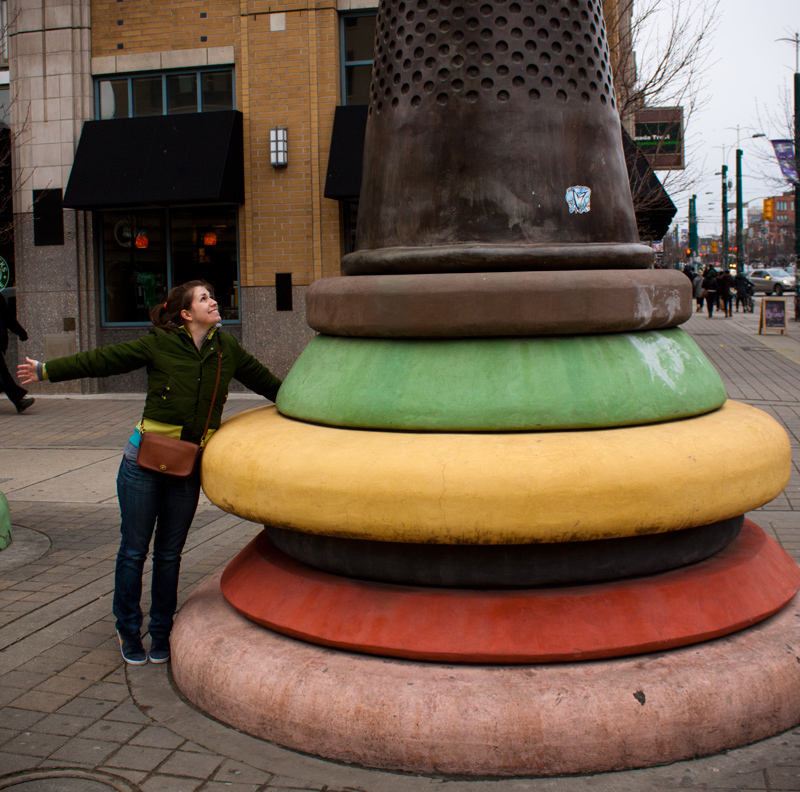 We hadn’t seen it in a not-molten state, of course, so we were very excited. As you can see, it matches my curtains quite nicely. And yes, it’s a little bit lopsided. But not very! 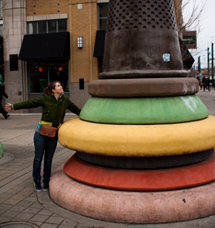 Also – it’s pretty big! The diameter at the widest point of the lip is nearly 7 inches. So it can fit lots of snacks. Our names can be easily removed, but I haven’t wanted to do so yet. I rather like them there, because it proves, hey, we made this. It was really fun to take time out from a busy week and go Make Something New. I love that feeling. 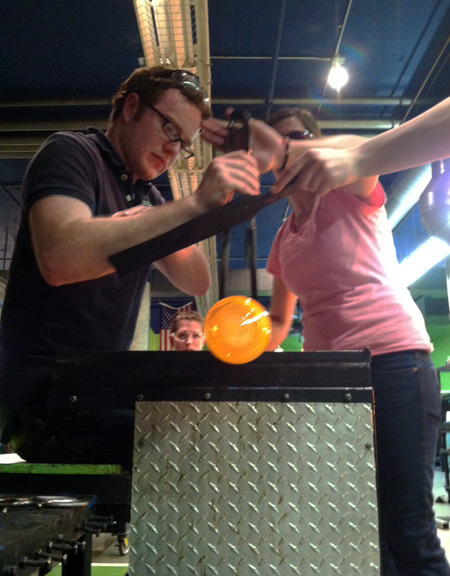 It was tricky – glassblowing is certainly an advanced art, and we had lots of help – but it was fun. I can’t wait to do more hot glass projects in my kiln this summer. And I can’t wait to eat lots of snacks out of this beautiful bowl. That is so cool – we watched the process on a field trip to Hale Farm – amazing.